Some might say that, in March, it’s a little too early to be mentioning the ‘C’ word. But then you go outside and feel the temperature. And now, the news has arrived that the spectacular Curve production of Irving Berlin’s White Christmas, starring Danny Mac and Dan Burton, will transfer to the West End this winter season. A feel-good family musical for the ages, White Christmas will play at the Dominion Theatre from 15 November 2019 until 4 January 2020. Danny and Dan will reprise their roles from the Leicester run, playing Bob Wallace and Phil Davis respectively. The show which has us dreaming of a White Christmas features music and lyrics by Irving Berlin, and book by David Ives and Paul Blake. It was last seen in the West End in 2014 – coincidentally also at the Dominion Theatre – starring Aled Jones. This production of White Christmas recently completed its run at Leicester’s Curve Theatre, reuniting Artistic Director Nikolai Foster with the double Olivier Award-winning choreographer Stephen Mear. Joined by the talents of Strictly Come Dancing finalist Danny Mac (On The Town, Regent’s Park Open Air Theatre) and Dan Burton (Gypsy, Jersey Boys, Chicago; West End), it warmed hearts of all ages and proved a certified smash-hit. The festive show is based on the 1954 film of the same name about two singers who, teaming up with fellow performers Betty and Judy, stage a fun-filled musical extravaganza to launch an ailing business. 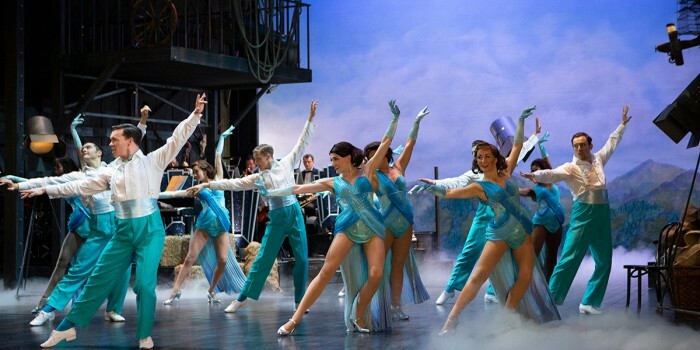 The musical features the classic songs Blue Skies, Sisters and, of course, White Christmas. Tickets for White Christmas will go on sale on Monday 25 March. Further casting will be announced at a later date.